Project Oversite is an industry leading billing and hosting services control panel. We have the confidence of thousands of happy customers that use our panel every day. Project Oversite has been in constant development since 2009 and has become a user-friendly, feature-rich control panel and to this day, we continue to build on that foundation. Because our customers have found it such a delight to use, we're now offering it as a product so that you can offer the same features we provide. Have you ever used our control panel? If so, we'd really like to hear from you. We've spent years improving our control panel to make life easier for our customers to use but we want to know what you think. How could things be easier for you to use? What functionality do you feel is missing? Or if you just have a general opinion, we'd like to hear about that too. We have a wide range of customers from basic users to sophisticated enterprise users and our control panel caters to both. We believe we've created an extremely flexible billing platform that goes above and beyond that of our rivals. A multitude of settings are available on a per-client, per-product and per-purchase basis. You have the ability to set minimum contracts, choose between anniversary or pro-rated billing, toggle automatic service/contract renewal (and choose when they do too). The ability for customers to self-help is key. That's why many billing functions that typically require intervension are exposed directly to the customer. Customers can renew, extend and cancel contracts/services on their own. The customer can choose between automatic renewals and manual renewals. Cancellations do not require any staff intervention even where minimum contracts are involved. The customer also has the ability to generate invoices in advance and/or align billing dates. Our control panel has been in use for over 5 years by several thousand customers so we know it's bullet proof. Each time an issue is found, we log it, we check it and we fix it. As users ourselves, we really do eat our own dogfood. Time is money. 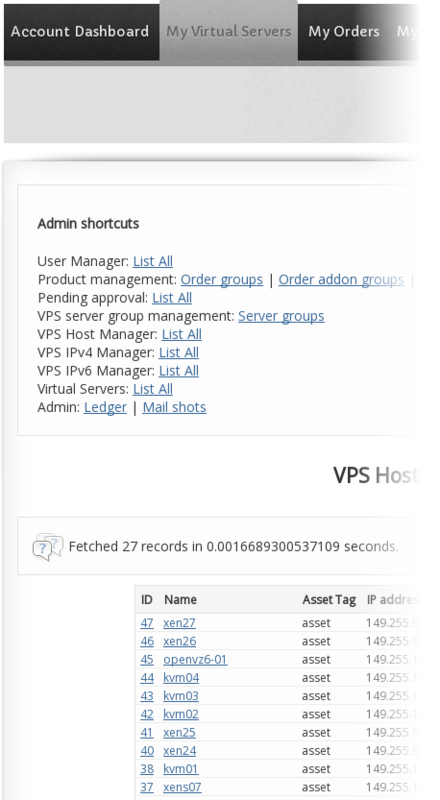 That's why we've created a VPS manager that goes above and beyond simple controls offered by our rivals, reducing management overhead. Your customers have control over almost every aspect of their service from the very beginning. Provisioning is done by the customer allowing them to select a server of their choice from a predefined list created by you that's tied to their package. Customers can request additional IP addresses. Not only can they choose their IP(s) from a list but our system records justification for reference as required by RIRs. With KVM based VPS, customers can mount their own ISO simply by pasting in a URL from public mirrors. This allows the customer to install virtually any operating system without staff intervention. 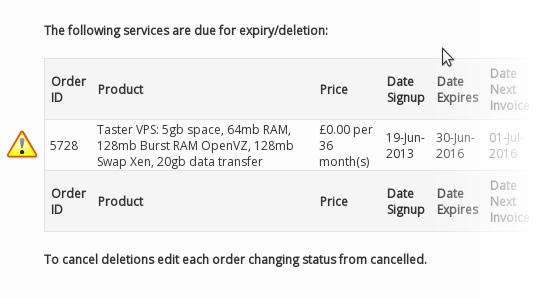 Xen and OpenVZ based VPS are based on easily-updatable templates allow your customer to reload their OS at any time without fuss. FTP integration allow provides your customers with the means to keep a copy of their data off-site for disaster recovery purposes. 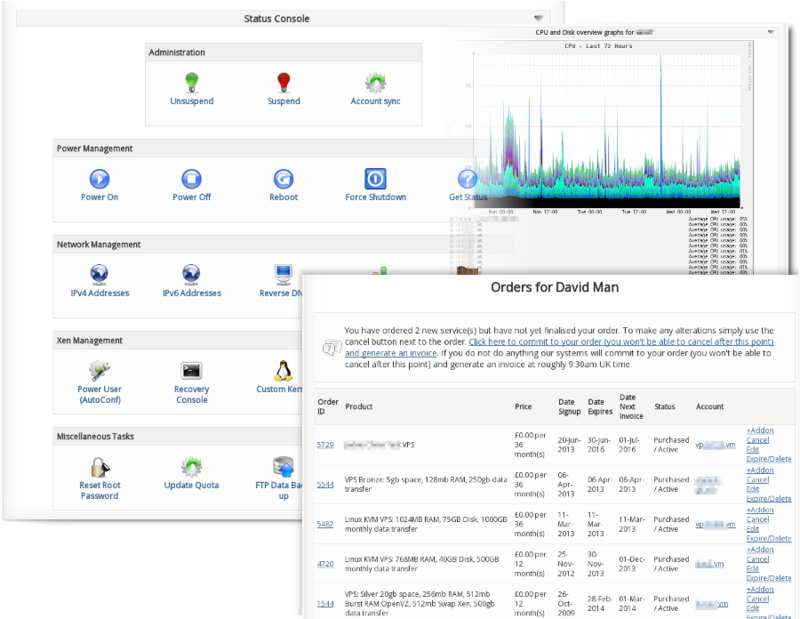 Traffic graphs are available on a per-IP basis. CGroups are supported on KVM to throttle or distribute CPU and Disk I/O evenly.